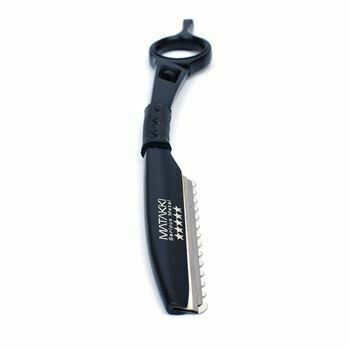 This unique professional texture scissor is designed in Japan using ATS-314 steel for the advanced hair artist who wants to chunk, notch and blend sections of hair. The Matakki Akechi is designed to perform with precision and accuracy thanks to its exclusive teeth design and the highest quality edge work enabling you to slide cut all the way out of your section. This scissor will create natural looking soft lines, texturize, add dimension and create volume to the hair style, you’ll wonder why you’ve never used a chunking scissor before now. The Akechi has a cut ratio of between 45/55%. We are so confident with our products that we offer an exclusive lifetime guarantee plus a 12 month drop warranty, drop your scissors within the first year and Matakki give you a free service worth £30! See our drop warranty section for more information.